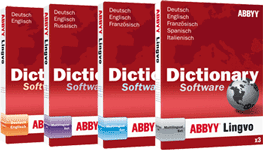 Found 6 file extension associations related to ABBYY Lingvo and 6 file formats developed specifically for use with ABBYY Lingvo. Lingvo is the most popular dictionary software in Russia because of its comprehensive, trustworthy and up-to-date dictionaries, instant translation features and ease of use. Lingvo provides translation of words and word combinations from Russian to English, German, French, Italian, Spanish, Chinese, Turkish, Ukrainian, Latin and back. Its library includes general, professional, specialized, regional, explanatory dictionaries as well as thesauri, phrasebooks, dictionaries of idioms and abbreviations, the majority of which are electronic versions of the most authorita­tive and up-to-date printed dictionaries. If you need more information please contact the developers of ABBYY Lingvo (ABBYY), or check out their product website.